As a complete professional imaging facility for over 35 years, you can trust you will receive the highest level of service combined with professional expertise that meets or exceeds your vision and your expectations. Giclée Printing: The term Giclée comes from French and means, “to spray.” The use of archival pigments plus fine art canvas and watercolor media greatly increases the archival longevity of your reproduction. Giclée printing offers a much wider color gamut than photographic reproductions through the use of 6 to 12 different inks. The added ink sets create a greater tonal range and vastly improves midtone colors. Our Giclée Master Printer expertly adjusts your digital file and reproduction print to match as close as possible to your original artwork or reference print. The Giclée Printing Studio lighting includes both simulated daylight and gallery lighting (Tungsten) situations so you can make informed decisions during the testing process with the final installation of your print in mind. Photos to Canvas Prints and Gallery Wraps: Print your photos on canvas prints for a distinguished look. A “Gallery Wrap” is a method of stretching Giclée canvas prints so the canvas print wraps around the sides of a wooden frame, called stretcher bars. The gallery wrap is then secured to the back of the stretcher bars in the traditional manner using staples. This method of stretching and preparing a canvas print does not require an expensive decorative frame and comes ready to hang. Canvas prints are available in a variety of widths from 3/4” to 2 1/2”. The image on the sides of the wrap is your choice of a solid color, a continuation of the image, or a reflection of the edge of the image. The latter is created by mirroring the edge in Photoshop or other image editing program. With a solid colored edge or a mirrored edge, the entire original image shows on the face of the finished canvas print. 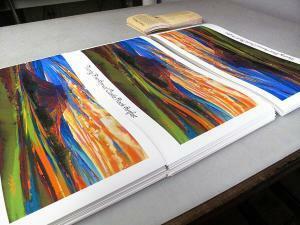 Your art or photo on canvas print is sprayed with a UV protective coating and then hand stretched. 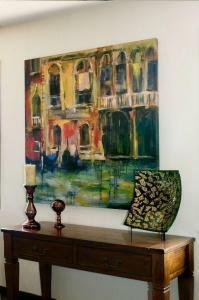 We carefully inspect each finished piece before it is available for pickup or delivery. Ask your personal creative team member about the photo on canvas gallery wrap option and how it will work for you. Photo Wallpaper / Wall Murals: Imagine your art, photograph, or design filling the room with a wall mural! Décor and exhibit graphics work on multiple levels. 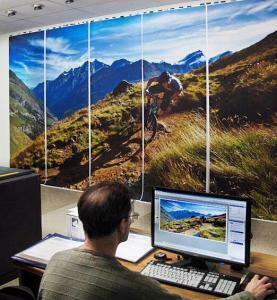 A custom photo wallpaper supports your goals and enhances the room. Wall murals create an environment consistent with the message that draws people in to take a closer look. Gallery Mount Photo Plaques: The Gallery Collection is a photo plaque style of presentation designed to enhance and protect any type image or graphic. Choose from 20+ different edge colors and hundreds of mat colors. This high quality photo mounting system provides a unique personalized look for your images that is durable, glassless and gives a greater degree of protection from moisture and harmful UV rays than many traditional and expensive framing methods. Ready to hang right out of the box, our Gallery Collection has become the preferred photo mounting presentation style for professional artists, interior designers and art consultants. Ask your personal project coordinator how the gallery collection will work for you. Gallery Clear Acrylic Presentation System: Acrylic face mounts are a process in which a photo print is archivally mounted behind a high-grade optically clear acrylic sheet. Acrylic face mounts add perceived depth to the printed image and provide exceptional brilliance and intensity. It is one of the most impressive photo mounting methods to display your fine art photography. Ask your team member about the choice of polished or satin edges on your acrylic photo mount. Drum and Desktop Film Scans and Photo Scanning: Your personal creative coordinator can assist you in choosing the right film or photo scan. We will let you know what scan options match your intended usage. We offer both low and high resolution film scans up to 8000 lines. For the highest resolution RGB film and photo scanning with maximum color fidelity, we recommend professional drum scans. Our Aztec drum scanner will digitize your transparencies, negatives and black and white film up to 8″ x 10″ in size. Prior to scanning, your film is inspected for any type of surface damage. All of our drum scans are oil mounted for the sharpest, cleanest scans possible. A member of our knowledgeable staff will use a calibrated display to color correct your drum scan and clean up any imperfections before the scan is printed or delivered to you.